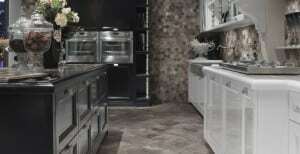 Should I Remodel my Tile Flooring? Many people contact Conestoga Tile for information about our tile flooring remodeling services in Harrisburg. Most people want to know whether or not a tile remodel is worth the investment of time and money. Fortunately, we’ve put together some facts that highlight remodeling benefits. Like all flooring, tile ages with time. Sometimes this is a good thing, most often it is not. Just think about that pea green tile your grandmother had in her home back in the 1970’s. For starters, it’s not quite as stylish as it once was. Further, tile wears out. This can lead to worn spots, cracks, chips, and discoloration. This detracts from the value of your home and can lead to water infiltration beneath the tile. When you remodel your tile flooring, you also have the opportunity to personalize your home in the process. Not only does it update the look of your home, it gives you the chance to choose colors and styles that genuinely reflect your personal tastes. Contact us at Conestoga Tile to learn more about our tile floor remodeling services in Harrisburg. We will be happy to answer your questions and make recommendations specific to your home and lifestyle needs.